DonorSearch provides comprehensive data on a donor’s wealth, then goes beyond to assess both their capacity to give and, based on their giving history, how likely they are to give larger gifts to you. This information is integrated with DonorPerfect so you can identify greater giving potential and capacity in either your current database or from an acquisition list. Instead of assuming a prospect will be philanthropic because they are wealthy, DonorSearch looks for prospects who are known for their philanthropy first, and wealth second. This proven methodology is based on extensive research that shows a qualified Major Gift prospect’s top characteristics are philanthropic driven: giving to your nonprofit and giving to other nonprofits. DonorSearch has enabled us to increase cash and pledge donations, as well as our major gift prospects’ involvement with the College, such as identifying potential board members or development committee volunteers. We were able to quickly realize a single pledge of $50,000 from a former board member previously giving $10,000 a year! ProspectView Screening includes a unique 5 step process, which uncovers those who best fit the characteristics of a major gift prospect. RFM Analysis – An internal analysis of the relationship between the prospect & your nonprofit. Philanthropic Review – A top to bottom philanthropic review on every prospect submitted. Wealth Review – Top to bottom wealth review. Assessment Process – Verification of the data by a prospect researcher increases the accuracy of the data & saves you time. Extended Analytics – Combination of internal & external giving information for easy to comprehend scores. The following is included to help you focus efforts on those who have a proven philanthropic history, an inclination to give, and have the capacity to give. A ProspectView Online subscription is a quick way to find information regarding your donor’s philanthropic history and wealth affiliation. Databases include philanthropic information, wealth information, and now INSTANT and SPECIFIC annual report references regarding your donor’s history and involvement with other nonprofits. 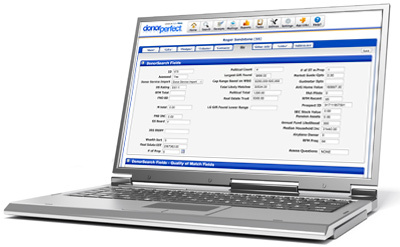 DonorPerfect’s integration enables you to click a button within a donor’s record and bring up their charitable giving and wealth information.